Is you’re a devout Ferrari fan, you are aware of speculation suggesting production of the Leferrari supercar being delayed. Even when the LaFerrari is available, the hybrid gasoline/electric high-performance machine is always intended to be an elite collection of 21st century motoring technology. Active aerodynamics, exceptional handling and 952 horsepower, the LaFerrari is a vociferous cry for where the Italian sports car maker will channel their future vehicles. At the upcoming Frankfurt International Motor Show, Ferrari has prepped a concept version of the 458 Italia acting as one of the first demonstrations of LaFerrari engineering. Enhanced beyond the original scope of the mid-engined V-8 sports car introduced in 2010, the Ferrari 458 Speciale brings greater performance and handling. 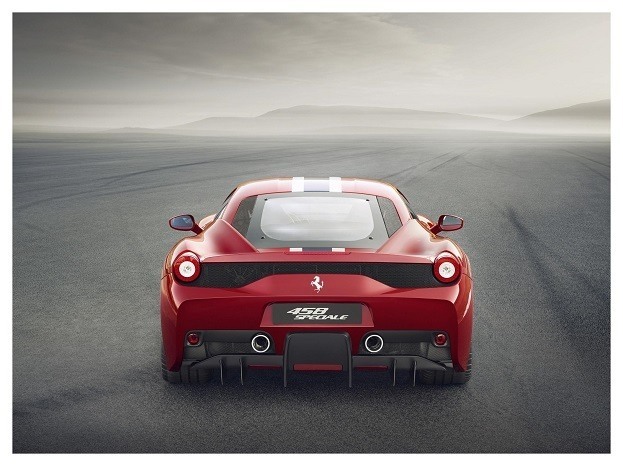 The Pininfarina exterior design of the new Ferrari 458 now features active aerodynamic elements at the front and rear. The movable exterior components allow the vehicle to achieve an optimal aerodynamic balance at a wider range of speeds. The exterior improvements made with the 458 Speciale in the name of performance have also resulted in reshaped bodywork. The front features an air dam reminiscent of a Formula 1 nose as well as a pair of openings on the hood. Unique exhaust pipe positioning and side detailing is also dedicated to the 458 Speciale. 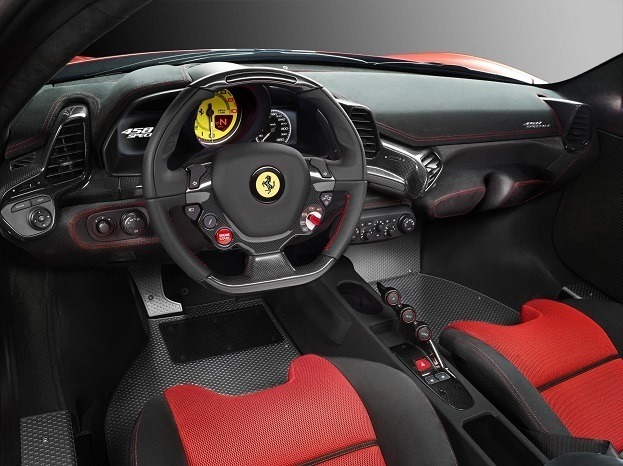 Along with the functional makeover of the outer shell, the Italian sports car maker’s 4.5 liter V-8 engine prances with a little bit more purpose on the Ferrari 458 Speciale. Opening up the 458 Italia’s powerplant to generate 605 cv (translating to 596 horsepower), the upgraded 458 is a 26 horsepower advancement over the existing engine. In concert with Ferrari’s HELE (High Emotion Low Emission) remains an active component in the 458 Speciale’s engine providing peak efficiency when the power is not required. In a straight line, the Ferrari 458 Speciale will blitz from 0 to 62 miles per hour roughly 0.3 seconds faster than the 458 Italia. Accelerating in just 3 seconds flat, the car joins an elite club of supercars that includes the Lamborghini Aventador. 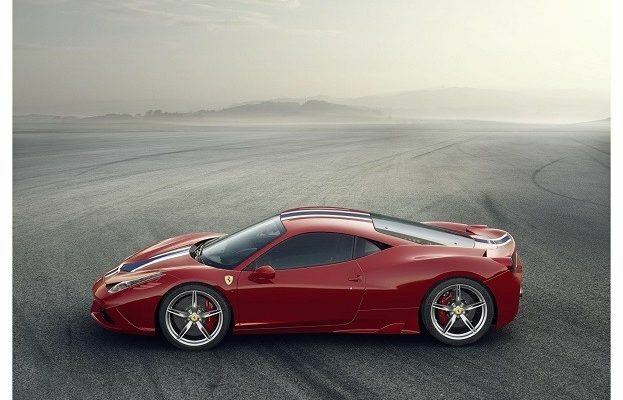 The Ferrari 458 Speciale needs only 9.1 seconds to cross the 200 kilometer per hour line on the speedometer. A super fast response time of 0.06 seconds is credited to the sports car’s swift launch. The Ferrari 458 Speciale is also equipped with a great deal of handling upgrades when drivers quickly tire with traveling in a straight line. The Side Slip angle Control system incorporating a new algorithm provides a heightened sense of cornering prowess with the new car. Transmitting data to the F1-Trac traction control and E-Diff electronic differential near instantly, the Ferrari 458 Speciale’s new handling technology combined with the active aerodynamics presents a vehicle that eagerly awaits the road as well as the track. Michelin Pilot Spot Cup 2 tires make contact with the road surface having undergone an extensive amount of engineering to make full use of the 458 Speciale’s ability. Speeding around the Ferrari’s Fiorano Circuit in 1 minute and 23.5 seconds, the 458 Speciale’s array of performance enhancements results in a 1.5-second improvement over the 458 Italia. Only half a second slower than the Ferrari F12berlinetta, the 458 Speciale was recorded with the highest amount of lateral acceleration found in their production vehicle range. 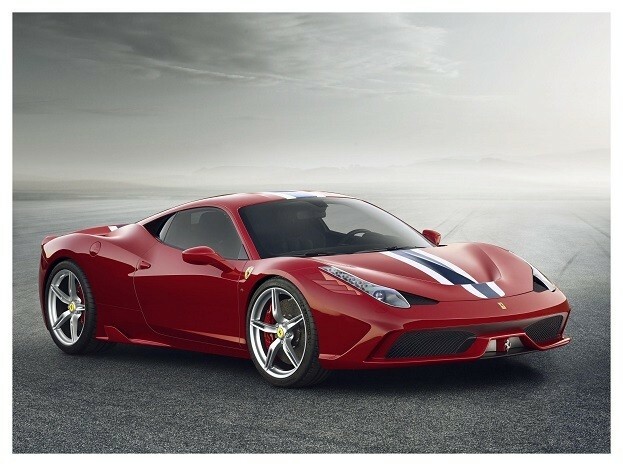 Set for its official world presentation in September, the Ferrari 458 Speciale is notably billed as a concept car. However, this does not suggest production of the advanced high-performance machine will not be considered. No Comments on "Special Delivery for Frankfurt: Ferrari 458 Speciale"